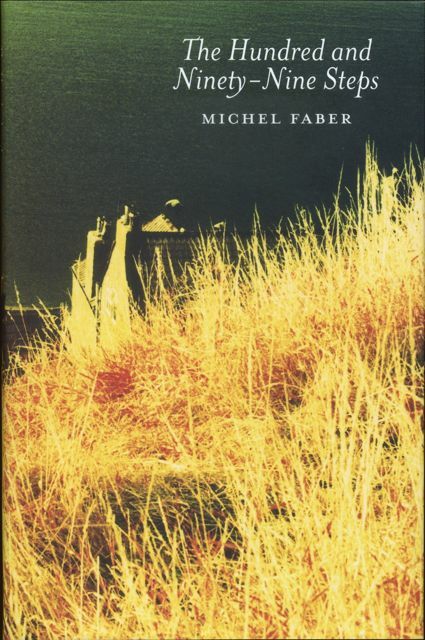 Michel Faber’s 2001 novella The Hundred and Ninety-Nine Steps (Canongate, 2001) centres on a 34-year-old parchment and paper conservator named Siân who is spending some time on an archaeological dig at Whitby Abbey in North Yorkshire. During her stay, she meets a final year medicine student called Magnus (or ‘Mack’) with a passion for jogging and a dog called Hadrian. Through Mack, Siân receives a scroll of papers kept in a bottle which he inherited from his late father: it’s the bloody confession of a whaler turned oil merchant named Thomas Peirson, dating from 1788, and which Siân is going to unravel. Ever since her arrival in Whitby, however, Siân has been having a recurrent nightmare in which a man with disquietingly large hands slits her throat, and it is indeed with such a beheading that the novella opens. Is the nightmare in any way tied to the ghostly abbey whose ruins dominate the city from atop the 199 steps? Or is it linked to the town of Whitby itself, since this is where the ship carrying Count Dracula is said to have run aground? Or perhaps it has something to do with the fact that Siân lost a leg during the Bosnian War when she was shielding her journalist boyfriend from an oncoming car (which boyfriend went on to dump her before being killed by sniper fire…)? Or the fact that she has cancer? Or the fact that she was declared clinically dead and has ‘seen the light’? Or perhaps it’s because she has a piece of Bosnian tarmac still stuck in her thigh, a piece which has been slowly making its way to the surface of her skin? This reader, for one, had the nagging impression that Siân’s nightmare was simply due to the fact that she’s a character in this nightmarish novella in which everything is so poorly constructed, so improbable, so unreal that one really can’t escape from it soon enough. 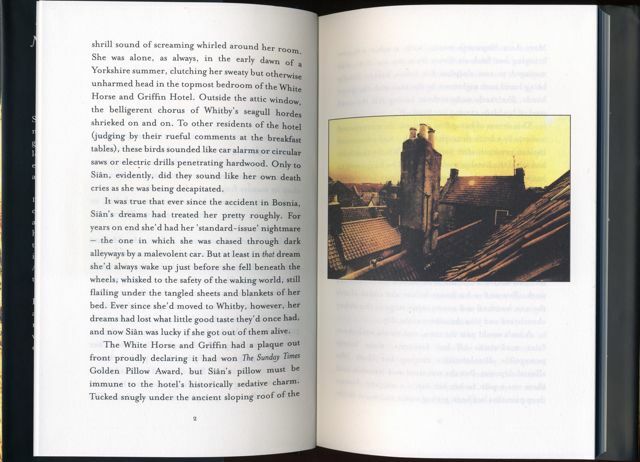 It’s a good thing, then, that some measure of escape is offered by the various colour photographs included in the book – or in the first, hardback edition at least, published by Canongate in 2001, since they have been omitted from the subsequent paperback editions. Paradoxically, it seems that it’s because they have been so heavily coloured that they seem more real, more believable: they show that things are not always what they seem and as such leave room for the reader to believe in them (whereas Siân’s story is so unreal that it’s impossible for the reader to believe in it). 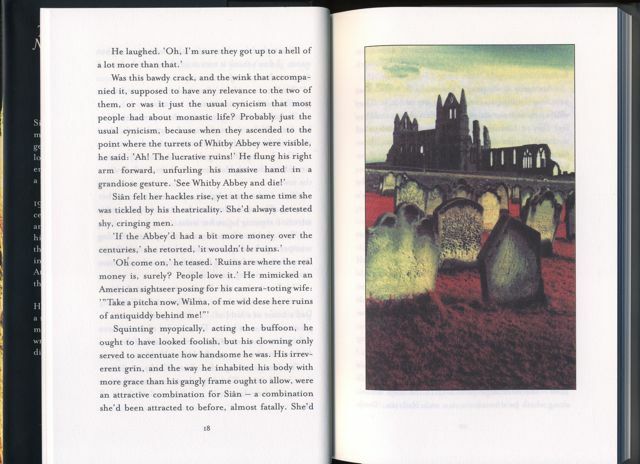 The pictures are said to have been digitally manipulated by Daniel Kratz from original photographs by Eva Youren (Faber’s wife, who used infra-red film), Faber himself and Keith Wilson (the latter was artist in residence at Whitby Abbey during the summer of 2000, and asked Faber to come and write a short story inspired by the English Heritage dig). For a selection of pictures comparing Whitby in the early 20th century and now, this website has an interesting selection of postcards and photographs. 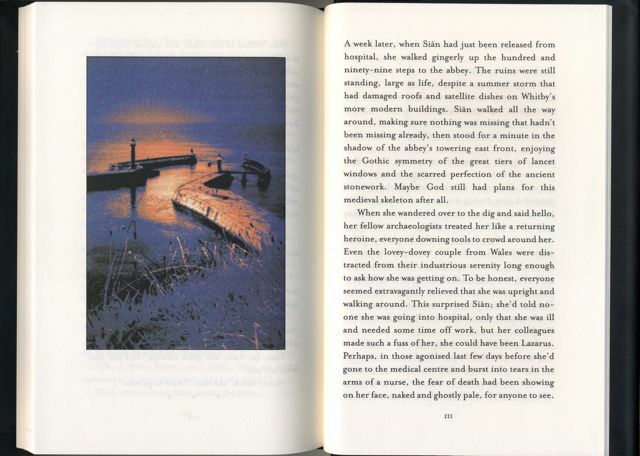 This entry was posted in Michel Faber, Picture novels and tagged Michel Faber, novels with pictures, photography, picture novels, The Hundred and Ninety-Nine Steps, Whitby Abbey. Bookmark the permalink.